Reducing the discharge and cleaning up sediment and trash in the Tijuana Valley is among the highest priorities of the San Diego Water Board. Since many of the sources of sediment and trash are outside of the jurisdiction of the agencies we regulate, the Water Board has convened a collaborative, stakeholder-led approach to address these problems. VISION: A Tijuana River Valley free of historical trash and sediment, protected from future deposits of trash and sediment, restored to a sustained physical, chemical and biological integrity, and performing its hydrologic functions, while respecting the interests of current and future landowners and users. MISSION: To bring together the governmental administrative, regulatory, and funding agencies in tandem with advice from the scientific community, the environmental community, and affected stakeholders to protect the Tijuana River Valley from future accumulations of trash and sediment, identify, remove, recycle or dispose of existing trash and sediment, and restore the Tijuana River floodplain to a balanced wetland ecosystem. 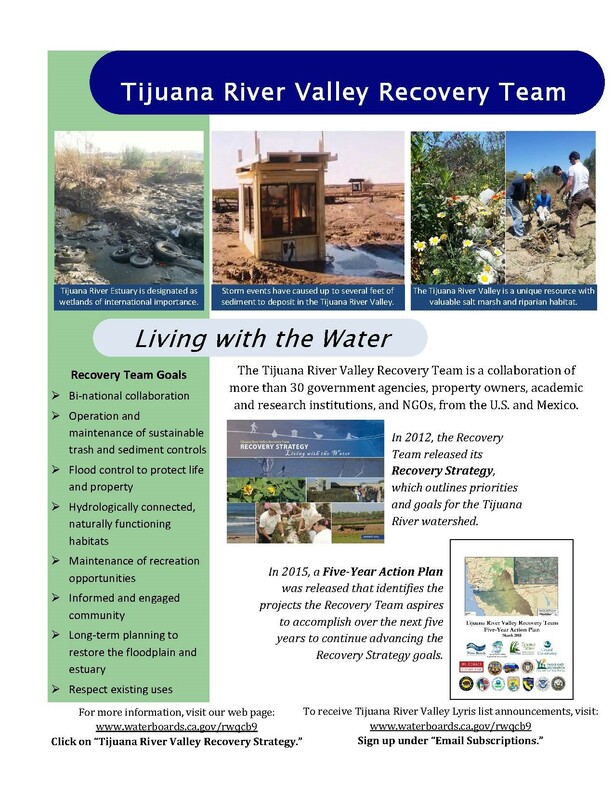 A key result of the Recovery Team’s efforts has been the development and release of the Tijuana River Valley “Recovery Strategy: Living with the Water.” The purpose of the Recovery Strategy is to concisely summarize the first phase of actions in a way that will allow stakeholders, policy makers, and potential funding sources have a clear understanding of both the problems and the solutions and help the Recovery Team to achieve its vision of a healthy Tijuana River watershed in a manner that is credible, durable, and acceptable to the communities on both sides of the border. On February 8, 2012, the San Diego Water Board adopted Resolution No. R9-2012-0030, strongly endorsing the Recovery Strategy. On March 16, 2015, the San Diego Water Board adopted Resolution No. R9-2015-0035, strongly endorsing a Five-Year Action Plan developed by the Recovery Team. The Five-Year Action Plan outlines the projects that the Recovery Team aspires to accomplish over the next five years to continue advancing the Recovery Strategy goals. The Steering Committee is comprised of the signatories and designated representatives of stakeholders who are Recovery Team members. The Steering Committee provides overall guidance for the Recovery Team and develops and convenes action teams as necessary to coordinate implementation of the Recovery Strategy and Five-Year Action Plan. Access our library to find studies, reports, and other materials relevant to Tijuana River Valley recovery. If there are additional studies and reports you would like to contribute to our online library, please contact Chris Blank at Christina.Blank@waterboards.ca.gov. Previous meetings and events focused on water quality and general stewardship in the Tijuana River watershed.